Deposition by river are in different places where slumps, alluvial fans, valleys, canyons, delta, waterfalls, floodplains. About 17 million years ago, a large block of crust, the region now known as the Colorado Plateau (located in Arizona, Utah, Colorado, and New Mexico), began to rise. Before the rise, the Colorado River had been ﬂowing over a plain not far above sea level, causing little erosion. But as the land uplifted, the river began to downcut. Eventually, its channel lay as much as 1.6 km below the surface of the plateau at the base of a steep walled gash now known as the Grand Canyon. The formation of the Grand Canyon illustrates a general phenomenon. In regions where the land surface lies well above the base level, a stream can carve a deep trough, much deeper than the channel itself. If the walls of the trough slope gently, the landforms is a valley, but if they slope steeply, the landforms is a canyon. 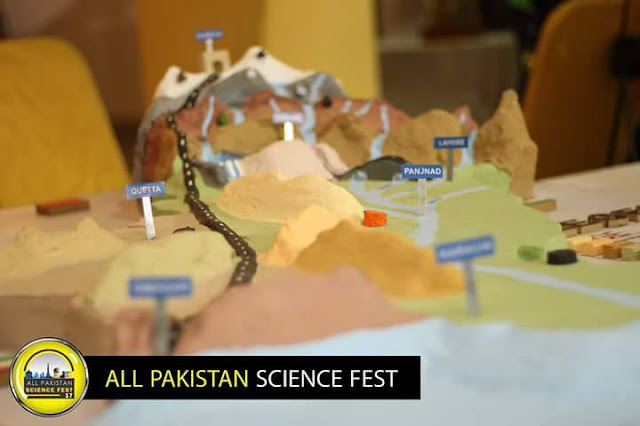 The shape of a canyon or valley depends on the resistance of its walls to erosion slumping. Whether stream erosion produces a valley or a canyon depends on the rate at which down cutting occurs relative to the rate at which mass wasting causes the walls on either side of the stream to collapse. 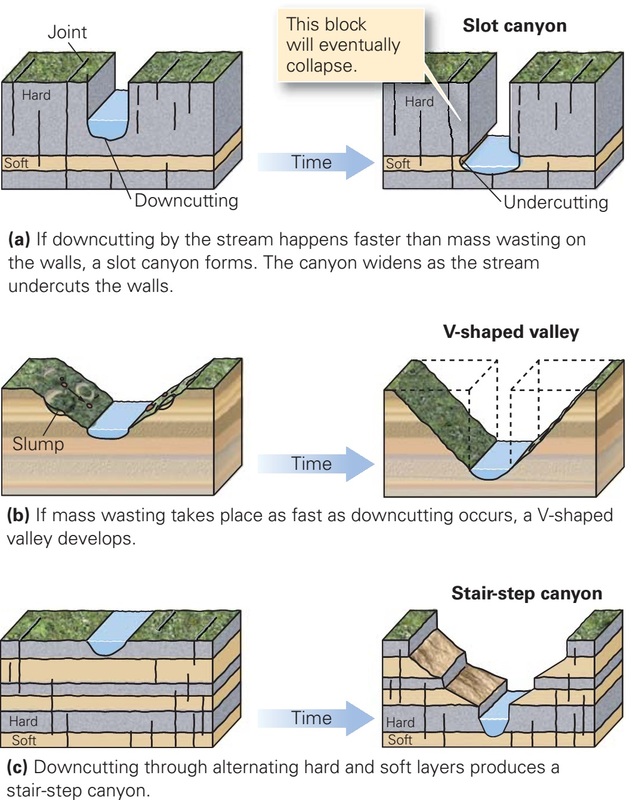 In places where a stream downcuts through its substrate faster than the walls of the stream collapse, erosion creates a slot (steep-walled) canyon. Such canyons typically form in hard rock, which can hold up steep cliffs for a long time (figure above a). In places where the walls collapse as fast as the stream downcuts, landslides and slumps gradually cause the slope of the walls to approach the angle of repose. When this happens, the stream channel lies at the ﬂoor of a valley whose cross-sectional shape resembles the letter V (figure above b); this landforms is called a V-shaped valley. Where the walls of the stream consist of alternating layers of hard and soft rock, the walls develop a stair-step shape such as that of the Grand Canyon (figure above c). The evolution of alluvium-filled stream valleys and the development of terraces. In places where active down cutting occurs, the valley ﬂoor remains relatively clear of sediment, for the stream especially when it ﬂoods carries away sediment that has fallen or slumped into the channel from the stream walls. But if the stream’s base level rises, its discharge decreases, or its sediment load increases, the valley ﬂoor ﬁlls with sediment, creating an alluvium-ﬁlled valley (figure above a). The surface of the alluvium becomes a broad ﬂoodplain. 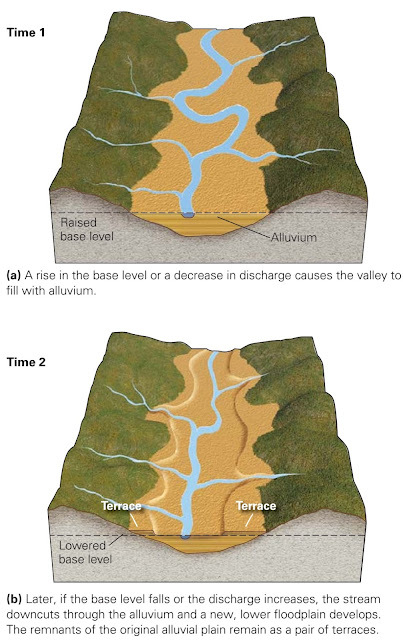 If the stream’s base level later drops again and/or the discharge increases, the stream will start to cut down into its own alluvium, a process that generates stream terraces bordering the present ﬂoodplain (figure above b). 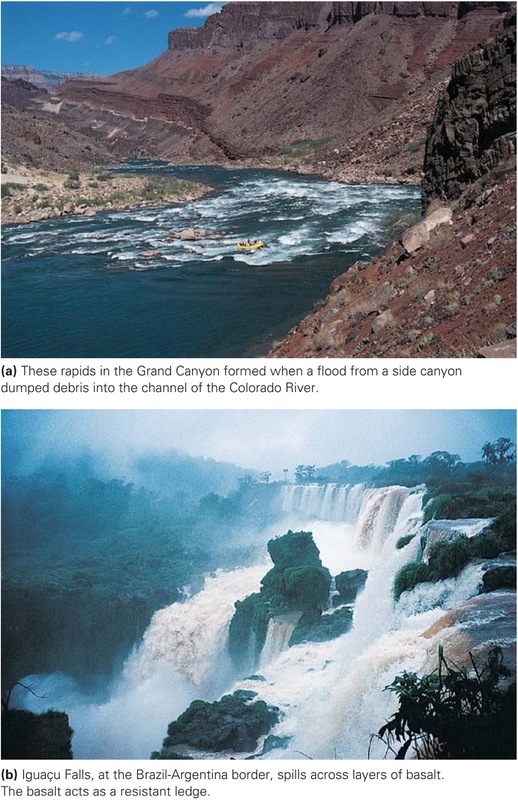 Examples of rapids and waterfalls. When Lewis and Clark forged a path up the Missouri River, they came to reaches that could not be navigated by boat because of rapids, particularly turbulent water with a rough surface (figure above a). Rapids form where water ﬂows over steps or large clasts in the channel ﬂoor, where the channel abruptly narrows, or where its gradient abruptly changes. The turbulence in rapids produces eddies, waves, and whirlpools that roil and churn the water surface, in the process creating white water, a mixture of bubbles and water. Modern-day white water rafters thrill to the unpredictable movement of rapids. A waterfall forms where the gradient of a stream becomes so steep that some or all of the water literally free falls above the stream bed (figure above b). The energy of falling water may scour a depression, called a plunge pool, at the base of the waterfall. Though a waterfall may appear to be a permanent feature of the landscape, all waterfalls eventually disappear because headward erosion slowly eats back the resistant ledge. We can see a classic example of headward erosion at Niagara Falls. As water ﬂows from Lake Erie to Lake Ontario, it drops over a 55-m-high ledge of resistant Silurian dolostone, which overlies a weak shale. Erosion of the shale leads to undercutting of the dolostone. Gradually, the overhang of dolostone becomes unstable and collapses, with the result that the waterfall migrates upstream. Before the industrial age, the edge of Niagara Falls cut upstream at an average rate of 1 m per year; but since then, the diversion of water from the Niagara River into a hydroelectric power station has decreased the rate of headward erosion to half that (figure below a, b). The formation of Niagara Falls, at the border between Ontario, Canada, and New York State. The falls tumble over the Lockport Dolomite, a relatively strong rock layer. Examples of depositional landforms produced from stream sediment. Where a fast-moving stream abruptly emerges from a mountain canyon into an open plain at the range front, the water that was once conﬁned to a narrow channel spreads out over a broad surface. As a consequence, the water slows and drops its sedimentary load, forming a sloping apron of sediment (sand, gravel, and cobbles) called an alluvial fan (figure above a). The stream then divides into a series of small channels that spread out over the fan. During particularly strong ﬂoods, the water contains so much sediment that it becomes a debris ﬂow that spreads over and smooths out the fan’s surface. In some localities, streams carry abundant coarse sediment during ﬂoods but cannot carry this sediment during normal ﬂow. Thus, during normal ﬂow, the sediment settles out and chokes the channel. As a consequence, the stream divides into numerous strands weaving back and forth between elongate bars of gravel and sand. The result is a braided stream the name emphasizes that the streams entwine like strands of hair in a braid (figure above b). 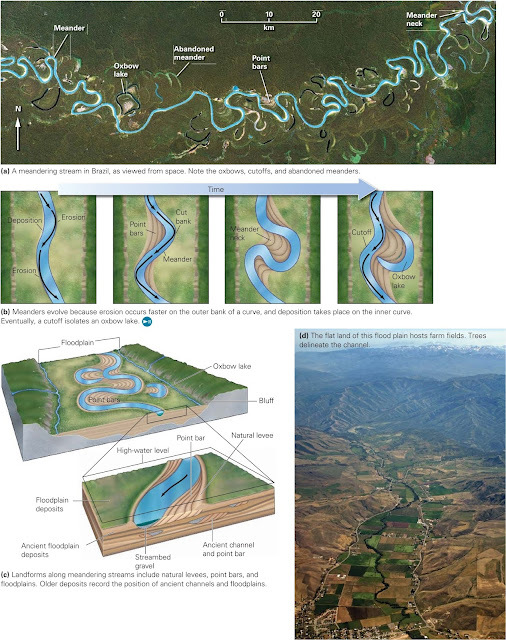 The character and evolution of meandering streams and floodplains. A riverboat cruising along the lower reaches of the Mississippi River cannot sail in a straight line, for the river channel winds back and forth in a series of snake-like curves called meanders (figure above a). In fact, the boat has to go 500 km along the river channel to travel 100 km as the crow ﬂies. How do meanders evolve? Even if a stream starts out with a straight channel, natural variations in the water depth and associated friction cause the fastest-moving current to swing back and forth. The water erodes the side of the stream more effectively where it ﬂows faster, so it begins to cut away faster on the outer arc of the curve. Thus, each curve begins to migrate sideways and grow more pronounced until it becomes a meander (figure above b). On the outside edge of a meander, erosion continues to eat away at the channel wall, forming a cut bank. On the inside edge, water slows down so that its competence decreases and sediment accumulates, forming a wedge-shaped deposit called a point bar, as noted earlier. With continued erosion, a meander may curve through more than 180 degree, so that the cut bank at the meander’s entrance approaches the cut bank at its end, leaving a meander neck, a narrow isthmus of land separating the portions of the meander. When erosion eats through a meander neck, a straight reach called a cut off develops. The meander that has been cut off is called an oxbow lake if it remains ﬁlled with water, or an abandoned meander if it dries out (figure above c). Streams that develop many meanders are known, not surprisingly, as meandering streams. The course of a meandering stream naturally changes over time, on a time scale of years to centuries, as new meanders grow and old ones are cut off and abandoned. Most meandering stream channels cover only a relatively small portion of a broad, gently sloping ﬂoodplain (figure above d). Floodplains, as we noted earlier, are so named because during a ﬂood, water over-tops the edge of the stream channel and spreads out over the ﬂoodplain. In many cases, a ﬂoodplain terminates at its sides along a bluff, or escarpment; large ﬂoods may cover the entire ﬂoodplain from bluff to bluff. As the water rises above the channel walls and starts to spread out, over the ﬂoodplain, friction slows down the ﬂow. This slowdown decreases the competence of the running water, so sediment settles out along the edge of the channel. Over time, the accumulation of this sediment creates a pair of low ridges, called natural levees, on either side of the stream. Natural levees may grow so large that the ﬂoor of the channel may become higher than the surface of the ﬂoodplain. Along most of its length, only a narrow ﬂoodplain covered by green, irrigated farm ﬁelds borders the Nile River in Egypt. But at its mouth, the trunk stream of the Nile divides into a fan of smaller streams, called distributaries, and the area of green agricultural lands broadens into a triangular patch. The Greek historian Herodotus noted that this triangular patch resembles the shape of the Greek letter delta, and so the region became known as the Nile Delta. Deltas develop where the running water of a stream enters standing water, the current slows, the stream loses competence, and sediment settles out. This can happen in either a lake or the sea. Delta shape varies depending on current activity, waves, and vegetation. Geologists refer to any wedge of sediment formed at a river mouth as a delta, even though relatively few have the triangular shape of the Nile Delta (figure above a–c). Some deltas curve smoothly outward, whereas others consist of many elongate lobes formed at different times. Bird’s-foot deltas, so-named because they resemble the scrawny toes of a bird, develop where several distributaries extend far out into relatively calm water; the end of the Mississippi’s active channel ends in a bird’s-foot delta (figure above a–c). A map showing ancient lobes of the Mississippi Delta. A major flood could divert water from the Mississippi into the channel of the Atchafalaya. The existence of several overlapping deltas indicates that the main course of the river in the delta has shifted on several occasions. These shifts occur when a toe builds so far out into the sea that the slope of the stream becomes too gentle to allow the river to ﬂow. At this point, the river overﬂows a natural levee upstream and begins to ﬂow in a new direction, an event called an avulsion. 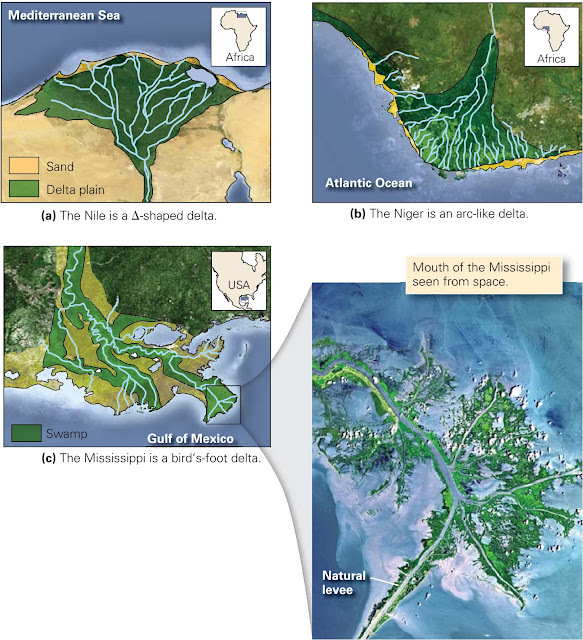 The distinct lobes of the Mississippi Delta suggest that avulsions have happened several times during the past 9,000 years (figure above). New Orleans, built along one of the Mississippi’s distributaries, may eventually lose its riverfront, for a break in a levee upstream of the city could divert the Mississippi into the Atchafalaya River channel. The shape of a delta depends on many factors. Deltas that form where the strength of the river current exceeds that of ocean currents have a bird’s-foot shape, since the sediment can be carried far offshore. In contrast, deltas that form where the ocean currents are strong have a $ shape, for the ocean currents redistribute sediment in bars running parallel to the shore. And in places where waves and currents are strong enough to remove sediment as fast as it arrives, a river has no delta at all. With time, the sediment of a larger delta compacts, and the weight of the delta pushes down the crust below. As a consequence, the surface of a delta slowly sinks. Distributaries can provide sediment that ﬁlls the resulting space so that the delta’s surface remains at or just above sea level, forming a broad, ﬂat area called a delta plain. But if people build up artiﬁcial levees to constrain the river to its channel, sediment gets carried directly to the seaward edge of the delta and the delta’s interior “starves” (does not receive sediment). When this happens, the delta’s surface drops below sea level. Because of this process, much of New Orleans lies below sea level.